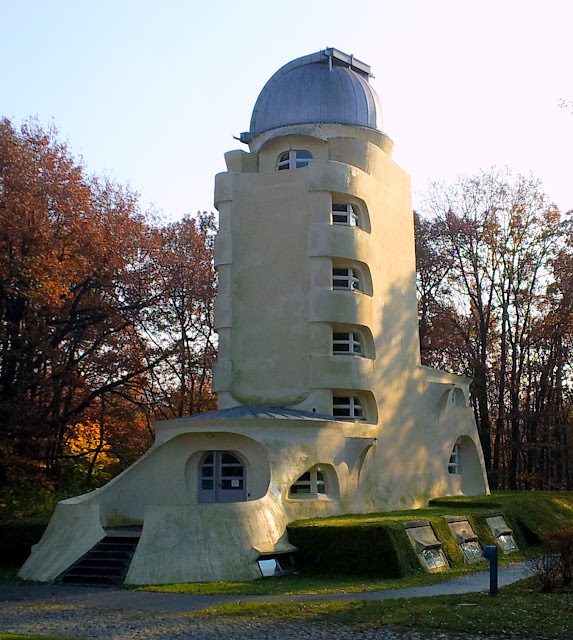 The Einstein Tower (German: Einsteinturm) is an astrophysical observatory in the Albert Einstein Science Park in Potsdam, Germany built by Erich Mendelsohn. 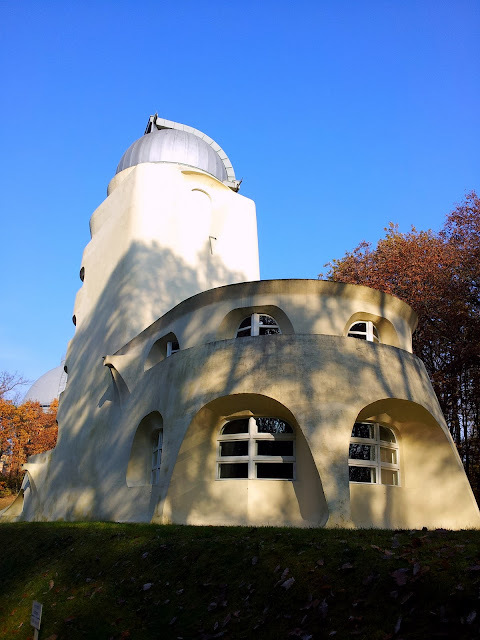 It was built on the summit of the Potsdam Telegraphenberg to house a solar telescope designed by the astronomer Erwin Finlay-Freundlich. The telescope supports experiments and observations to validate (or disprove) Albert Einstein's relativity theory. The building was first conceived around 1917, built from 1919 to 1921 after a fund-raising drive, and became operational in 1924. Although Einstein never worked there, he supported the construction and operation of the telescope. It is still a working solar observatory today as part of the Leibniz Institute for Astrophysics Potsdam. Light from the telescope is directed down through the shaft to the basement where the instruments and laboratory are located. The exterior was originally conceived in concrete, but due to construction difficulties with the complex design and shortages from the war, much of the building was actually realized in brick, covered with stucco. Because the material was changed during construction of the building, the designs were not updated to accommodate them. This caused many problems, such as cracking and dampness. Extensive repair work had to be done only five years after the initial construction, overseen by Mendelsohn himself. Since then numerous renovations have been done periodically. It is often cited as one of the few landmarks of expressionist architecture. This is definitely an odd building, particularly so in the context of Potsdam. The shape reminds me a bit of the Great Sphinx of Giza, but the Sphinx has been transformed into a kind of machine ready to travel through the cosmos at light speed. I find it to be "ahead of its time" and quite remarkable. 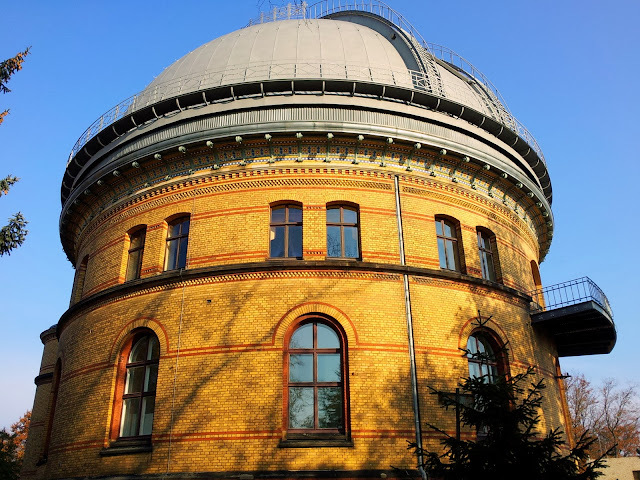 The astrophysical observatory Potsdam is immediately adjacent. Completed in 1879. Observatories are very unique structures. This one is one part villa, one part water tower, and one part rook. As I walked through the park, I was struck by the quietude and solemnity of the place. I imagine that this really represents what working as an astrophysical observer entails. Long hours of serious meditation and study. To unravel the mysteries of the universe, a perfect place this once was.